This book will show you another path to the changes you want in your life. It’s a gentle, empowering, delight-filled journey. It’s an unfolding that celebrates your spirit. Instead of the tired, torn, and tattered map of Old Thinking, Quantum Thinking shows us that creating life-shifts is a flexible journey. Some of you will want a little more of one ingredient; others will omit ingredients. Each will mix the 64 ingredients of change differently, and everyone can create the personal transformation desired. Along the way, you’ll realize you don’t have to struggle. You’ll find that your good intentions are no longer fighting something deeper and stronger. Creating changes with Quantum Thinking means you are no longer the hard-working, overwhelmed Cinderella. You are the fairy godmother who makes it all happen. Get your own autographed copy here at Spirals. 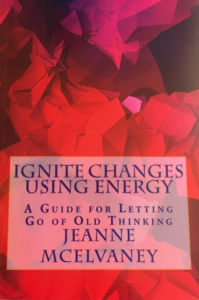 Just ask in the comment section on the check out and Jeanne will personalize your copy with a little message to you.